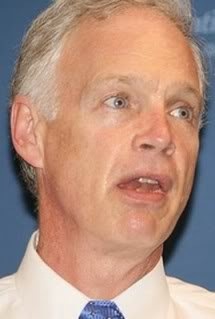 Cognitive Dissidence: Ron Johnson Is Number One! The Washington Post says that the Republican majority in the US Senate could very well be a short lived one. Democrats would need to flip four or five seats to regain control and of the ten most vulnerable seats, eight of them are Republican. 1. Wisconsin (R): Sen. Ron Johnson starts the 2016 election cycle as the most vulnerable senator on the map. He's undefined in the eyes of many, polling shows; and he's running in a state that has gone Democratic in seven straight presidential elections. To boot, there are rumors that Democrat Russ Feingold, who Johnson unseated in 2010, may run. Feingold would start with high name recognition and a loyal liberal following. RoJo took office in 2010, during the midterm Republican sweep, in an upset over the very popular Feingold. RoJo likes to claim that he is a self-made millionaire businessman and that everyone could be if only it weren't for that darn government getting in the way. Poor old RoJo forgets that he actually married into the millions he has and that the company he runs was a gift from his father-in-law. RoJo apparently learned his hatred of government when he got a low interest government loan of $2.5 million. (Maybe he got upset when he had to pay it back.) The poor suffering man also had to endure getting a railroad line built up to his factory, thanks to a HUD grant. And showing that he is a typical Republican hypocrite, RoJo has some of his employees on the state-subsidized BadgerCare. Yet other employees are actually prison inmates who work for serf wages and have health care provided by the state. Yes, Rojo has really suffered at the hands of the government. Leading a everlasting Quixotic campaign against the Affordable Health Care Act. Blaming global climate change on sunspots. As the gentle reader can see, there is ample fodder to use against RoJo. Furthermore, the authors of the WaPo article are correct that in Wisconsin's state wide races, where gerrymandering is not a factor, tends to go to Democrats, especially in presidential years. In 2012, Senator Tammy Baldwin easily defeated former Wisconsin Governor Tommy Thompson. If Feingold does run again, and wins, that would go a long way to make up for the embarrassment of Scott Walker being elected three times in four years as governor. Great news about Feingold, hope it's true. True, he has a rich, full life overseas now. Has married again--this time to an Oxford Don. What do you call a woman who marries into money? A: a gold digger. What do call a man who marries into money? A: a self made millionaire and the senior senator from WI. RoJo can't be rich, but Mary Burke was just fine. I hope Feingold runs again, too. Dems really rock that shallow bench. If he doesn't, maybe Barrett will go for it. Or even Burke! As long as you keep Mike Tate, I'm good with whomever you front. Don't forget Rojo's other important job: driver of the clown car! Cindy, RoJo married the daughter of a billionaire. Burke was born into the family. Why don't you mention Chris Abele, whose Dad is a billionaire? Who do you suggest to replace Mike Tate? RoJo is gone soon and it will be an easy pick off in the General. Good riddance. Wish it were true about Feingold, but I have a feeling that it isn't. We look forward to taking on Senator Johnson in the 2016 contest. At this time, we're building an enormous database on the Google Drive, of the ridiculous positions that Wisconsin's other Senator has been taking on all the crises of the day. Wisconsin Green Party's Senatorial candidate. "Peer-reviewed, or it never happened."